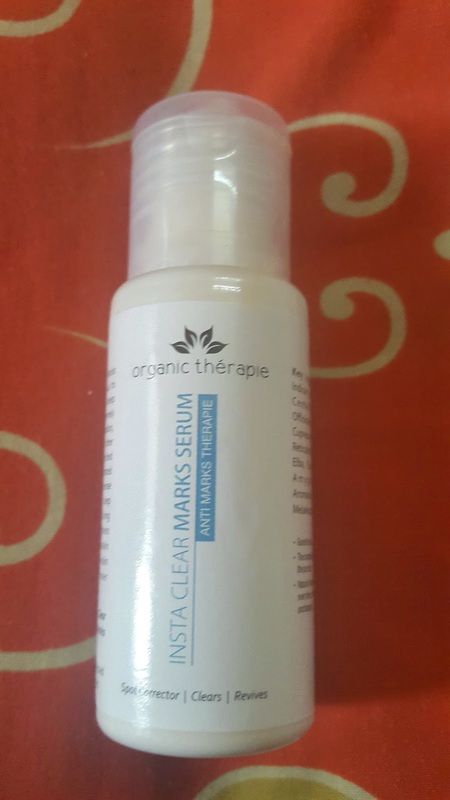 Organic Therapie Insta Clear Marks Serum Review By Dr. Farhat Sultana – Organic Thérapie Inc. It is enriched with essential oils and concentrated nourishing ingredients to provide intense repair for damaged tissues. Its deep penetrating action ensures the fast & long lasting results. It also strengthens connective tissues to boost natural skin toning process, thereby giving your skin a clearer complexion & firmer appearance. Price : Rs 249 for 50gm. Available Here and on Flipkart. Ingredients List : Sesamum Indicum,Hibiscus Rosa Sinesis,Centella Asiatica, Emblica Officinails Oil Extract, Mineral Oil,Cupressus Sempervirens, Eclipta Elba, Cocos Nucifera Oil, Prunus Amygdalus,Juniperus Communis,Shyzsium Aromaticum, Melaleuca Alternifolia,,Vitamin E.
Organic Therapie Insta Clear Marks Serum comes in a transparent bottle with a flip cover in a white and blue cardboard box bearing all the details of the product. It got easy and travel friendly packaging. 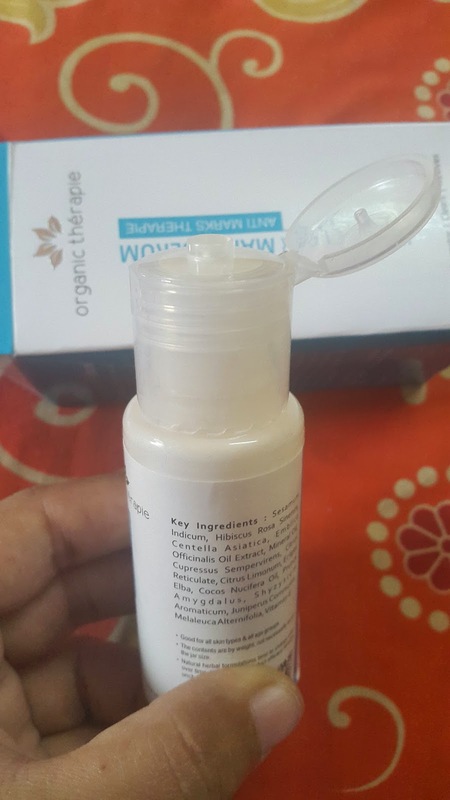 The serum is white liquid which is neither too thick nor runny in consistency having nice floral fragrance. It states us to use on the affected parts and to keep overnight. 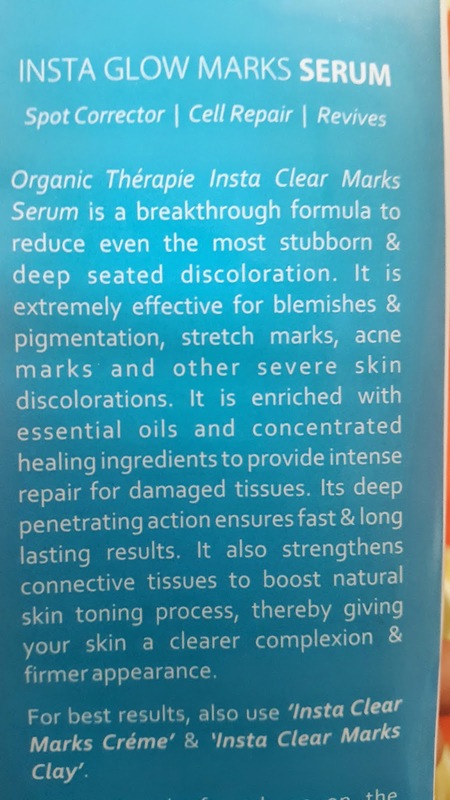 So basically it is not used on entire face and is used only as spot treatment. It's easily incorporated into night care regimen. 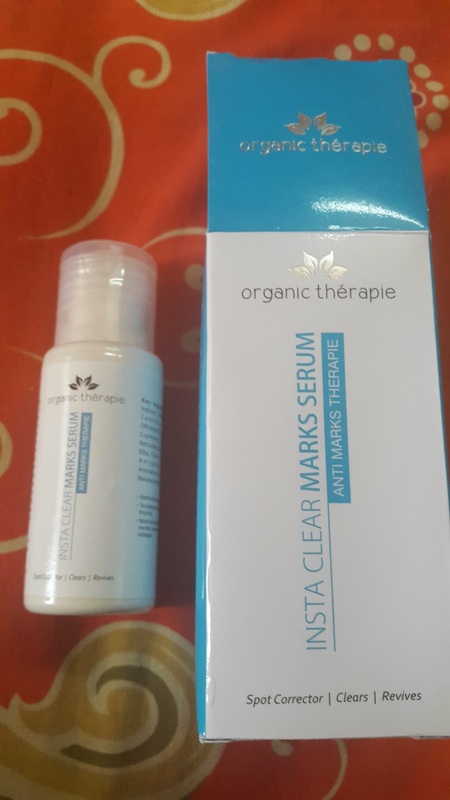 When applied on affected areas likes acne spots, blemishes, sunburn, pigmentation etc it gets easily absorbed into the skin and is non-greasy and non-sticky. When you gets completely committed to it's use it definitely shows results overtime bit slow in action but effective. It's SLS and Parabens free and suits all skin types. It lightens the pigmentation overtime. 1. Affordable and easily available. 3. Lightens the pigmentation to some extent overtime. 4. SLS and Parabens free. 6. Non-sticky and non-greasy and light weight. 1. The results are great, but I wish it could work faster. Rating : 4 / 5. 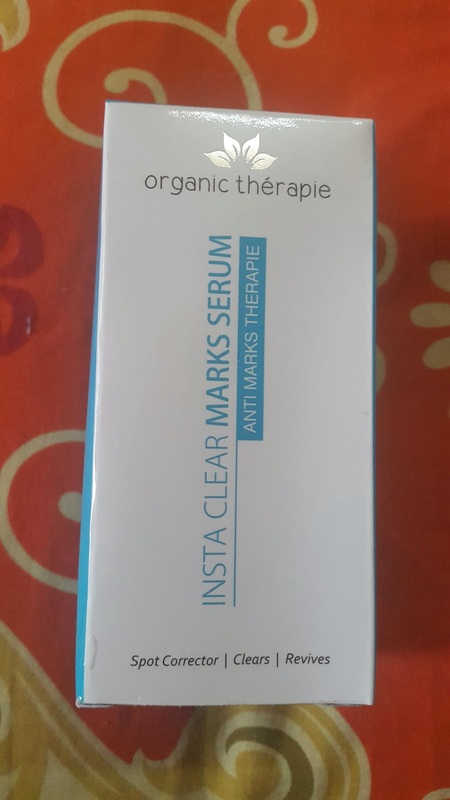 To Sum up : Organic Therapie Insta Clear Marks Serum is white coloured serum which is non-sticky and non-greasy. It is light weight suitable for all skin types. It clears pigmentation overtime.